Now I know why people laugh at me when I try to speak in their language, while I’m traveling! Watch it and try not to laugh! Do The Magic Have a Chance to Win the NBA Finals? Most would agree that the Orlando Magic have looked like the best team thus far in the NBA Playoffs. The problem is, that can, and often does, all change when you step on the court with the Lakers. Prior to Game 6, I was questioning whether Dwight Howard could be the centerpiece of an Orlando offense that seems to live, and occasionally die by the three. Saturday night, Howard proved he could be a force inside on more than just open dunks and second chance points. Even in doing so, however, the Magic still jacked up 29 three pointers. That’s great when they’re going in, but the problem with the Lakers is they will bury a team, more so than any other squad, when the threes are not falling. Look no further than Game 6 of the Western Conference Finals. The Nuggets converted a fairly solid 8-19 from beyond the arc, but the missed attempts seemed to stand out. That is ultimately what did them in Friday night. The Lakers have an uncanny ability to stick to their game plan. Thanks to the presence of Kobe Bryant – who I still can’t help but to concede is still the best player in the league – they never seem as flustered as anybody else. Even without any standout shooters of the same caliber as Rashard Lewis, Hedo Turkoglu, Mickael Pietrus, and even Rafer Alston, they boast an impeccable balance of size, speed, length, and basketball IQ that it would be surprising if they lost more than two games in the upcoming series. Can the Magic match up with Bynum, Gasol, and Odom down low? I just can’t see that happening. What happens if Howard gets in foul trouble? I have a hard time seeing Gortat patrolling the paint and doing anything defensively to slow the Lakers on the block. I never thought I’d say this, but Adonal Foyle could be a key x-factor in the championship series. Problem is, Foyle has logged a total of 4 minutes the entire postseason. However, the Magic will need all the big bodies they have, and Stan Van Gundy doesn’t seem likely to call on Foyle off the bench. There’s probably a reason for that. You won’t ever hear me call Phil Jackson the best coach in the league – I’m of the crowd who chalks his success up to having great players. But you can believe he will have his team defending the three-point arc without any lapses. The key guy in this series, and not many people would see this the same way, will be Courtney Lee. Lee has shown a supreme mastery of the ever popular mid-range jumper. With LA likely having one or two big men locked into the paint and the other guys firmly planted around the three-point line, it will be imperative for Lee to dominate the 15-20 foot area. The Magic must set an unofficial Finals record for most pump fakes and pull up jumpers to have any chance in this series. I just don’t know if guys like Turkogu and Pietrus will be able to stray from their three point dependancy. THE KEY ASPECT I look to in the postseason is, for lack of a better word, swagger. What I mean by this is having players who have the mental toughness to go for the jugular and not get rattled when the other team is making a run. The Lakers have this. They always have. Sure, they’ve looked far from immortal this postseason, but we all know when it’s on the line, they’ll bring their A game. Any time you have Kobe on the floor with you, you know the game is always within reach and there’s no reason to panic or get scared. The Celtics were able to counter this thanks to the presence of Kevin Garnett. The Magic don’t have a guy like this. Looking up and down their roster, I don’t see many guys who can keep their composure when the Lakers are laying it on thick. I’ve seen guys like Turkoglu and Pietrus crumble in big situations. If Chauncey Billups and Carmelo Anthony couldn’t do it, how can they? Orlando will need flawless execution and resiliancy to pull this one off. If they can survive the Staples Center and come away with a split, perhaps we can believe in them in a little bit. But there’s no way they will win a Game 5 or 7 in Los Angeles, so they definitely have their work cut out for them. Needless to say, I don’t see it happening. Lakers in 4. ….maybe 5. Well, it’s a 50-50 chance according to him. I’m giddy at the thought of the possible places he could land. I personally think if he did, he would be an amazing player back in the D’antoni system as he’s proved he can thrive with him as a coach before. It’s reported that he made a visit to Atlanta and Chicago as well. Personally, I think he needs to get out of Phoenix. Teaming him up with Rose, and an unselfish big man in Noah would make them a contender! There have been problems with Amare there since they acquired Shaq. I’m sure the Suns would let him, his fancy goggles, and his $17 million he’s set to make next year walk out the door to free agency if that’s what he wants. Since it’s such a large amount, I can’t see why he’d leave, unless he really does care about a winning championship, or if he finds a team that has a deal in place before he’s eligible! Here’s the article. So, I have to add to the post now that I’m watching the Cavs play. Don’t you think they could really use a scoring big man for Lebron to throw lobs to, and make Dwight work a little harder on the defensive end? I searched through Cleveland’s upcoming off-season and what their cap will look like, and they have $13 million coming off the books from Szcerbiack, and $7 million coming off the book for Eric Snow’s expiring contracts. That’s plenty to lure the likes of goggle man! I now believe that he may opt-out! From the depths of youtube…. The ongoing NCAA investigation within Memphis has people questioning whether Derrick Rose’s SAT scores were legitimate when he was given his eligibility. There is no doubt in my mind that this has to be at least partially true, but we will see as the investigators finish their report. I also feel that Memphis probably turned the blind shoulder if they were in fact aware that someone did take Rose’s SAT test for him. Rose taking Memphis on their march through the NCAA tournament was amazing, but even more amazing for the schools pocket book, and ability to recruit other top All-Americans. Well, everybody knows all of this, but since there now are many players like him are stopping through college for a “one and done” it makes for a tough case that they even were interested in the academic portion. They just want to shine enough in their one year to be drafted into the big show. Another player in the same draft class, OJ Mayo, was charged with accepting gifts from agents in his high school years, which would make him ineligible for college. He had a great season and was a lottery pick, which is as good as hitting the lottery. So far the NCAA has turned up nothing for either of the cases, and we all know that these types of things are happening over and over! Since the NBA decided to make these eligibility rules why didn’t they also create some system to give them some of the money that the school makes off of them? There are lots of student jobs that schools will pay their students for, so are they considered professionals if they are being paid for something related to their major? Sure, more than I’ll ever be in any of those fields… Is it out of the question to give a student athlete a job of playing a sport?!? Sure it would put some schools out of the running for the top rated players in the country, but isn’t that the way it is already! I’m not saying to give them millions to play in college. I’m saying that there needs to be a system to rate the top 50 high school basketball players on there way to a one year stint in the NCAA, and give them some type of incentive based salary. I know some alumni would definately donate a few extra bucks to get their former school the next Derrick Rose. Hell, I’m sure they already do! If he doesn’t win the award, he did give men 21 great reasons to wear condoms! Since our blog was born from an e-mail chain, I figured it would be fitting to post one of the funniest e-mail chains I’ve ever seen. I know it’s old, but enjoy, if you haven’t seen it before… The spider was sold on Ebay for $10,000.00 on a later date, so David definately could pay his bill! Our records indicate that your account is overdue by the amount of $233.95. If you have already made this payment please contact us within the next 7 days to confirm payment has been applied to your account and is no longer outstanding. I do not have any money so am sending you this drawing I did of a spider instead. I value the drawing at $233.95 so trust that this settles the matter. Thankyou for contacting us. Unfortunately we are unable to accept drawings as payment and your account remains in arrears of $233.95. Please contact us within the next 7 days to confirm payment has been applied to your account and is no longer outstanding. Can I have my drawing of a spider back then please. You emailed the drawing to me. Do you want me to email it back to you? Subject: Whose spider is that? Dear Jane, Are you sure this drawing of a spider is the one I sent you? This spider only has seven legs and I do not feel I would have made such an elementary mistake when I drew it. Subject: Re: Whose spider is that? Dear David, Yes it is the same drawing. I copied and pasted it from the email you sent me on the 8th. David your account is still overdue by the amount of $233.95. Please make this payment as soon as possible. Thankyou for contacting me. I am currently away on leave, traveling through time and will be returning last week. Subject: Re: Re: Whose spider is that? Hello, I am back and have read through your emails and accept that despite missing a leg, that drawing of a spider may indeed be the one I sent you. I realise with hindsight that it is possible you rejected the drawing of a spider due to this obvious limb ommission but did not point it out in an effort to avoid hurting my feelings. As such, I am sending you a revised drawing with the correct number of legs as full payment for any amount outstanding. I trust this will bring the matter to a conclusion. Subject: Re: Re: Re: Whose spider is that? Dear David, As I have stated, we do not accept drawings in lei of money for accounts outstanding. We accept cheque, bank cheque, money order or cash. Please make a payment this week to avoid incurring any additional fees. Subject: Re: Re: Re: Re: Whose spider is that? I understand and will definately make a payment this week if I remember. As you have not accepted my second drawing as payment, please return the drawing to me as soon as possible. It was silly of me to assume I could provide you with something of completely no value whatsoever, waste your time and then attach such a large amount to it. Subject: Re: Re: Re: Re: Re: Whose spider is that? Let the debate begin: Should Manny Ramirez represent the Dodgers and Major League Baseball in the 2009 All-Star game? No one can deny the talent Manny possesses, and the fact that he is a true All-Star of the game of Baseball. Few know of the work ethic he has established to maintain his legendary hand-eye coordination and balance in the batters box. He brings joy to so many with his antics and boyish love of the game. Even the critics have to laugh at the strange plays that develope more frequently around him than any other leftfielder in recent memory. Rarely do you see one outfielder go out of his way to get involved in a relay throw from another outfielder, or high-five fans at the wall in the middle of a double play. Rarely? How bout never. That’s just “Manny being Manny”, a prime example of the forgiveness he’s afforded. And through all of the good times, there seems to be a strong continued support for Manny even now after a 50-game suspension for breaking the leaugue’s banned substance policy. No matter the broken hearts and the embarassing deconstruction of his own Section in Dodger Stadium, there is still an overriding majority of fans who support his cause. None of this is more evident than the fact that he trails Carlos Beltran for the third outfielder in All-Star voting by less than 35,000 votes as of today. Manager Joe Torre expressed his position, saying he didn’t think Manny should take part if voted in. He also obliged that Manny would probably feel the same way at this point. So why does Manny continue to receive so many votes from his fans? It’s for the same reason Mark McGwire and Barry Bonds were such polarizing athletes in the media and in the fan’s homes: Persona. While Bonds and McGwire shunned the media and presented a holier-than-thou attitude for most of their careers (ok, McGwire lightened up a tiny bit at the end), Manny has always been the exact opposite. In front of fans and the media, he has always played the role of an average Joe who happens to have an exceptional talent. Manny is jovial, he’s carefree, he’s so damn talented, and the fact of the matter is fans have and always will appreciate Manny. They continue to ignore the contract disputes and the back talk he’s become famous for while airing his disputes in the media. If nothing else, Manny is this: Popular. And let’s not forget the All-Star ballot is a popularity contest won over and over again by good players in big markets. The player with the better first half does not always win, and in no case (outside of farewell tours for retirees) will this be more evident than in 2009. Manny being voted in this year will make for more fodder than journalists will be able to keep up with, and we are just beginning to see the tip of the iceberg. As a fan of Baseball and spectacle, Thank You Manny Ramirez for creating this ongoing debate for months to follow. Manny completes a triple play, but gets credit for only two outs. As the curtain comes down on another fantastic Premier League season, we are treated to the final act of the domestic season with the FA Cup final. As any soccer fan knows the FA Cup is the longest running tournament in world soccer, and with it brings considerable accolades should you hoist the trophy. It has an odd way of turning around a truly awful or disappointing season in 90 quick minutes. 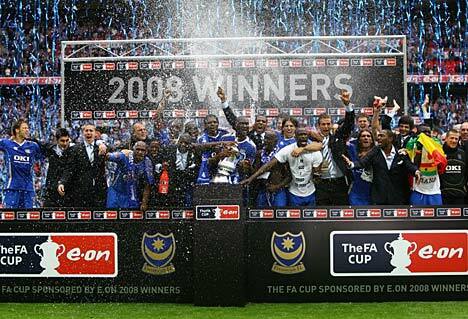 Just ask Portsmouth last year, or perhaps Arsenal in 05’ as the failed to win the Premier League but ousted Manchester United to pull a dismal season back on track. Over the last 20 years the list of finalists seems to drum up the same familiar names of English power houses. Manchester United lead the way with 9 final appearances, Arsenal 7, Liverpool 6, and Chelsea rounding out 5. This year’s final brings back a familiar face with Chelsea FC looking to grab its sixth title in as many appearances, taking on a resurgent Everton football club who would love to stamp there emerging authority in English football with a trophy. In many ways this final represents two polar opposites within the Premier League. On one side you have mega rich Chelsea with resources and cash to address any need or desire. And on the other Everton, who with a lack of a large bank roll have had to grind away with smart buys, solid loans, a fantastic youth system, and gut wrenching sales (17 year Wayne being the most obvious example). This years Everton side although lacking in depth is full of talent we have been unaccustomed to seeing with past squads. Leading the charge is English work horse Leon Osman, swash buckling Tim Cahill, excellent Marouane Fellaini, and oft injured Louis Saha, and holding down a very impressive back line Joleon Lescott and Joseph Yobo (Phil Jagielka sits because of injury). If ever there was an Everton side ready to take home silverware and create a massive upset this just might be the team. On the opposite side towering Chelsea, brimming with confidence under the guidance of Guss Hiddink (SIGN HIM UP ROMAN!!!!). Still aggrieved over the stunning loss at the hands of Barcelona in the Champions Leagues semi’s, the FA Cup stands as the last opportunity for redemption in a other wise tumultuous season. Chelsea would appear to have a full squad at there disposal, with the only real question being the formation. Will Hiddink roll out a traditional 4-4-2 to accommodate both Anelka and Drogba upfront? Or will he continue to employ a 4-3-2-1 that might shift Anelka to the bench leaving Drogs up front? Both formations for Chelsea over the last three months have wielded tremendous results and neither can be faulted at this point. With a wave of momentum that has out played Barcelona, Liverpool, and Juventus in Europe, and a 11-2-2 league record since February, Everton will have a massive mistake free 90 minutes to handle if they want to take a result. With a makeshift attack and Jo cup tied. Everton seem to be a player or two short for this match up. With a valiant effort and a short lived lead in the first half, Chelsea stretch there class in talent out to a 3-1 win, to take home there sixth FA Cup in six attempts. What Do You Think About DOIN-WORK? If this video is for you, I’m sorry. Christ, what demographic are the commericals trying to reach? I hope our blog is never THIS BAD. Seriously, these guys usually post good stuff, but this one made me wanna shove a chopstick in my ear. Such a promising title, so much potential, and then a complete dud. Thank god for comments or else this page would be a complete waste of cyberspace. And thanks to #6 for referencing “I Like Turtles.” Haven’t watched that one in a while. Let’s all enjoy it together…. Every few days (as quality of content warrants) I’ll be posting WTF videos that I stumble across on the wonderful world of Youtube. First up, California Governor Arnold Schwarzenegger’s epic commercial back in the day he did in Japan.